Projects let you share resources with groups. When you add a group to a project, you also choose a project role for that group, which limits the permissions of the members of that group within the project and for resources shared in the project. For more information about project user roles and permissions, see Understanding project roles. Navigate to the project details page. From the navigation bar, click Projects. The Projects page displays. Click My to display a list of the projects you own, or Company to display the projects you are a member of. Click the name of the project. The project details page for this project displays. Click the Groups tab. The group list and the users list for the project displays. At the top of the Groups list, click Add groups to project. 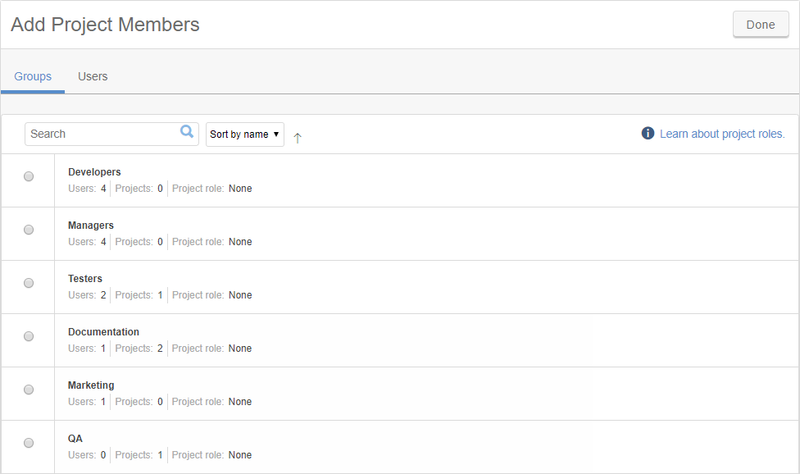 The Groups tab of the Add project members list displays a list of all groups in your account. Click the button next to the user you want to add. The project role selector displays for that user. Choose the role that the user will have in the project. There is no limit to the number of groups you can add to a project. Click next to the group that you want to remove. The Remove group dialog displays. Removing a group from a project doesn’t delete the group. For information about creating and deleting projects, see Create, edit, or delete a project. For information about adding and removing environments for a project, see Adding and removing environments in a project. For information about adding and removing templates for a project, see Adding and removing templates in a project. 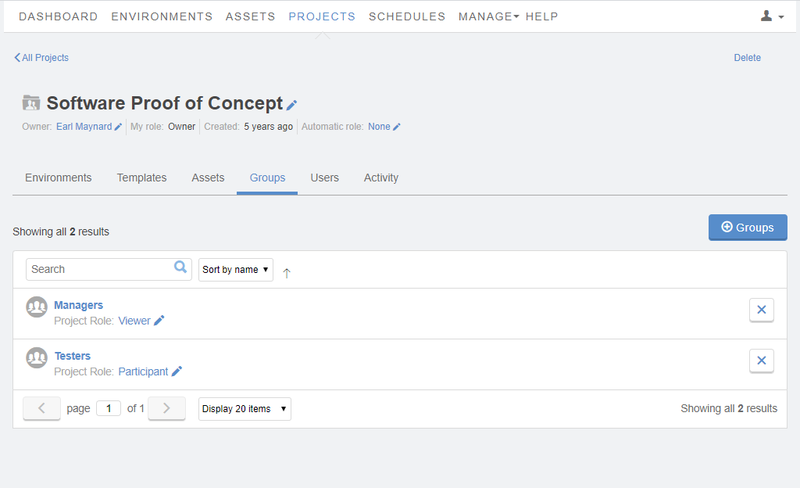 For information about adding and removing assets for a project, see Adding and removing assets in a project. For information about adding and removing users for a project, see Adding and removing users in a project. For information about project roles, see Understanding project roles.